Blue cheese buffs should check out Scottish producer HJ Errington, which has all bases covered after launching a new blue goats' cheese. Based at Walston Braehead farm in Ogcastle, just south of Edinburgh, the company is best known for its Lanark Blue ewes' milk cheese, which has been dubbed Scotland’s answer to Roquefort. 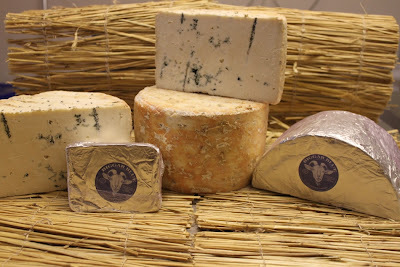 But it has also long made a powerful blue cows' milk cheese called Dunsyre Blue, and has just completed the 'milk set' with a goats' cheese called Biggar Blue, after the nearby town. I haven't managed to get my hands on it yet, but, according to Scottish distributor Clarks Speciality Foods, it has a “clean sharp taste with strong but pleasant goaty notes”. It's made with unpasteurised milk and and vegetarian rennet and joins HJ Errington's other new cheese Corra Linn – a Manchego-style sheeps' milk cheese, which was launched last year. The cheesemaking business was set up by Cambridge graduate Humphrey Errington in 1985 and today has a 500-strong flock of Laucane sheep. Humphrey's daughter Selina Cairns, and her husband Andrew, took over four years ago, although Humprhey does keep a watchful eye over proceedings. Selina told me the new goats' cheese had initially just been an experiment, but Clarks had been so enthusiastic she decided to add it to the range.